BELGRADE (Serbia), February 4 (SeeNews) - Anti-government protests spread across Serbia on Saturday in the eighth weekend of rallies against what opposition sees as an increasingly autocratic rule by president Aleksandar Vucic and the government led by the populist conservative party SNS. In addition to Belgrade, rallies were held in the cities of Nis, Novi Sad, Kragujevac and Cacak, the organiser of the rally, opposition Alliance for Serbia led by former Belgrade mayor Dragan Djilas, said in a statement on Saturday. A series of protests have been held in Belgrade since December 7, following the assault on Borko Stefanovic, leader of the Serbian Left party. 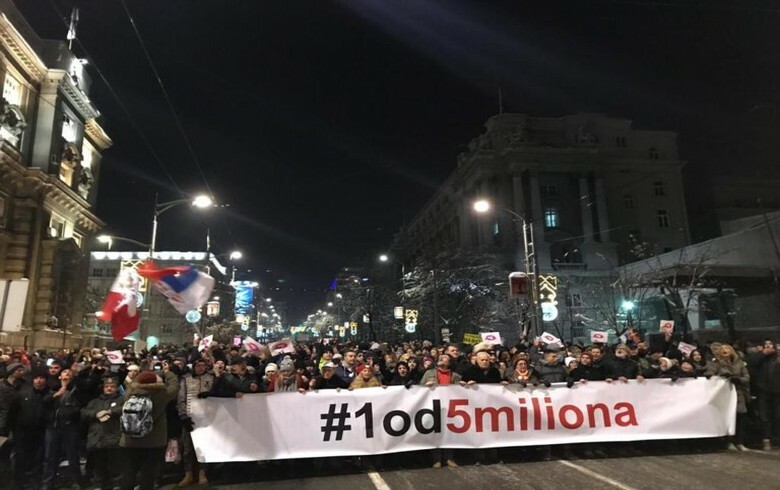 The rally was organised under the "One of five million" slogan referring to a statement by Vucic that he would not fulfil any of the protesters' demands, even if they were five million. In an interview with private broadcaster Pink on Sunday, prime minister Ana Brnabic said the protests were annoying because they are based only on opposition statements and are not considering the results achieved by the government. "The protesting opposition does not respect any other position," she said. The Alliance for Serbia accuses SNS and Vucic of provoking the attack against Stefanovic, who was assaulted by a group of men on November 23 in Krusevac, in southern Serbia, and suffered injuries from being beaten with an iron rod. The protests show whether the people agree with the policy of Vucic, the mayor of Sabac and one of the founders of Alliance for Serbia, Nebojsa Zelenovic, said in a video file posted on its YouTube channel. "We have a referendum on the street - are people supporting this system which allowed Vucic to destroy all our institutions," Zelenovic said. The Alliance for Serbia was established before the local elections in Belgrade held in March 2018. It was later joined by the leading opposition parties in Serbia, namely the Democratic Party, Serbian movement Dveri and the People's Party. The Serbian Left party is a member of the alliance. Djilas, a former chairman of the Democratic Party, was a mayor of Belgrade between August 2008 and November 2013, when he lost a motion of no confidence.